Social media platforms are used these days by various companies to make a brand identity. Facebook, Twitter and Google + are the most popular social media platforms. There is a huge traffic on them that can be diverted towards your e-Commerce website.Several attempts of integrating social media with e-Commerce have failed in the past. A U.S based data company surveyed over 500 million e-Commerce sessions on social media and found that only 1.5% of traffic came from social media. The coming year brings in various smart techniques that can be integrated to improve website traffic, brand awareness and get organic likes from users. Let’s have a look on them. All Internet Marketing strategies start with a web site or a blog site. We drive customers to our sites to buy products or services. Use of article or Video Marketing can help increase customer participation. By commenting on a blog post, Video or Facebook Page, customers are directly engaging with the company that provided information. This is how you interact with people and build long term relations in a way. It is one of the great ways to maximize the reach of your products and services. The “Share” button is found on every social networking website. Users can view your products and share them as well. This button can be added on your e-Commerce website with just one plugin. The most popular buttons which you can use are “Like” for Facebook, “Tweet” for Twitter, “Share” for LinkedIn, “Pin it” for Pinterest and so on. Integrated Marketing approach involves the use of various tools like advertising, public relations, e-mail database marketing, event marketing, social media marketing and so on. Social media along with Email should be used in concert with one another. In this case, you can set up your own emails to be automatically posted on your social media sites. Get to your audience wherever they may be. Whenever you set up email campaigns, be sure to add permanent links to your social profiles, along with links for social sharing of your email campaign’s content. Then promote your email campaigns on social platform, including links to the specific campaign or offer you are promoting. Social Media Marketing works best when it is an overall integrated strategy that promotes your business over multiple channels and technologies. 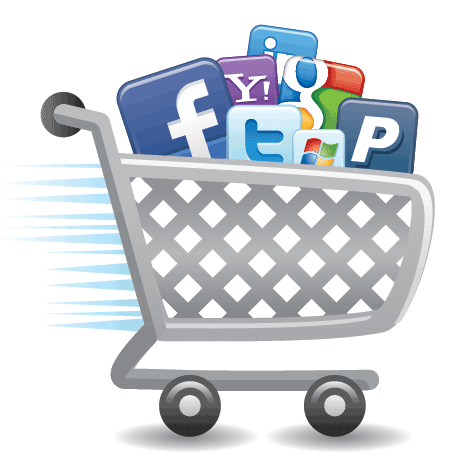 Social commerce is selling with social media that supports user contributions and social interaction. Sports brand “Nike” has recently revived this idea with a custom made Facebook application that allows people to bid for and buy Nike sneakers. Besides, using social media platforms for completing sale transactions, it can also be used for collecting and sharing feedback- ratings, reviews and recommendations from customers’ social network. E-commerce applications from social media sites help vendors sell directly from social media such as from their blog, Youtube channel or Facebook Page. These ranges from simple storefront plug-ins that republish an external e-Commerce site on a social media page to stand alone e-Commerce applications for social media. In short, you can fully utilize these simple steps to engage people for building up relationships and enhance brand loyalty. Start using these smart tips that can help you to unleash the full potential of social media arena to market your products and services.